If you’re looking to check out a cool new spot on Franklin Street, look no further than Ice & Lab, Chapel Hill’s first rolled ice cream shop. The quaint pink storefront at 405 W. Franklin Street is owned and managed by Andy Chen and Nick Ni. 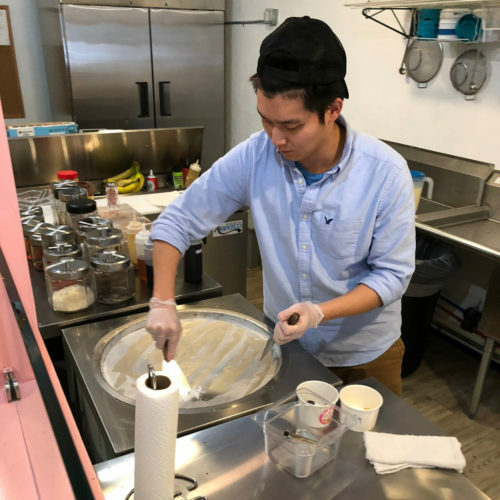 The shop offers rolled ice cream – a frozen confection consisting of thin sheets of ice cream frozen on a flat surface and rolled into cylinders. The process isn’t unlike cooking on a reverse griddle, and the results are undeniably eye-catching. The dessert originated in Southeast Asia, but spread worldwide as a food trend after videos of the treat circulated widely on the internet. Chen’s inspiration for opening the shop hit when he tried rolled ice cream and was surprised by how much he liked it. Chen knew he wanted Ice & Lab to reside in the Triangle. He visited several university towns, but it was Chapel Hill where he ultimately decided to build his business. Between the downtown feel of Franklin Street and the young college crowd just a block away, Chen was sold. “I saw it was more fun than Duke, so that was why [we chose Chapel Hill],” Chen said. Chen and Ni spent months searching for the right rolling machine, which was hard to come by in the United States. Once they found it, Ice & Lab was officially off the ground, formally opening in September of 2018. Ice & Lab’s menu is extensive, with 15 curated combinations and an open-ended menu that allows customers to build their own roll. Plenty of flavors, from vanilla to green tea and beyond, can be mixed with topping and options such as fruit and cookies. The machine pours the ice cream base onto a freezing plate, creating an ice cream “pancake,” of sorts. After freezing in a thin layer on the plate, the rolls are created using metal spatulas and no small amount of skill. Once rolled, the ice cream can be topped with treats and drizzled with sauce. Chen strives to keep his customers happy year-round. In order to do this, he keeps a rotating menu of seasonal products — including hot teas in the winter and Asian shaved ice in the summer. Ice & Lab’s owner, Andy Chen, rolls ice cream off the machine. Ice & Lab has also made efforts to entice more students into the shop, offering $1 for all students alongside monthly specials. Students have certainly taken notice, as many visited the new spot to check out the special treat. Katie Heuser, a senior at UNC, was passing by one day when she decided to try Ice & Lab. Sophomore Michaela Campbell went to Ice & Lab after her boyfriend, who loves rolled ice cream, found it on Yelp. 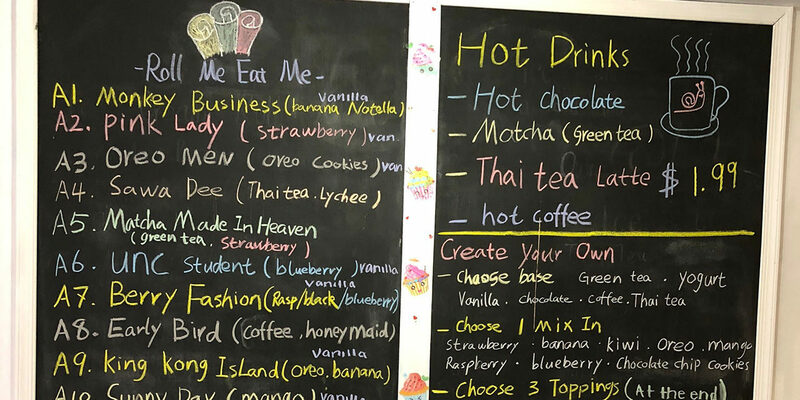 While students have been able to appreciate the vibe and taste of Ice & Lab, Chen is still striving to keep up with the increasing demand for dairy-free ice cream. Looking to the future, Chen said an expansion could be in the cards. Now, they are currently more focused on getting settled in and catering to students and families in the community. “For now, we are trying to make a good business,” Chen said.